Try Context for free. Then take advantage of flat rate pricing and activate all-you-can-eat hi-res access to every surface in the Context Surface Store for $14 a month, with no other fees. Context activation couldn’t be simpler. Access a selection of free trial surfaces (marked with a Trial badge in the Surface Store) for one month. Selection may change. Upgrade at any time. A monthly auto-renewing all-access subscription to every hi-res surface in the Surface Store. Upgrade at any time. A yearly auto-renewing all-access subscription to every hi-res surfaces in the Surface Store. Upgrade at any time. One Year studio group plans are available at a discounted rate. Configuring plans can be simply configured inside Context or via the Studio Tool. You can try Context in demo mode with watermarked surfaces for free. And getting a paid subscription is easy and built right into Context. 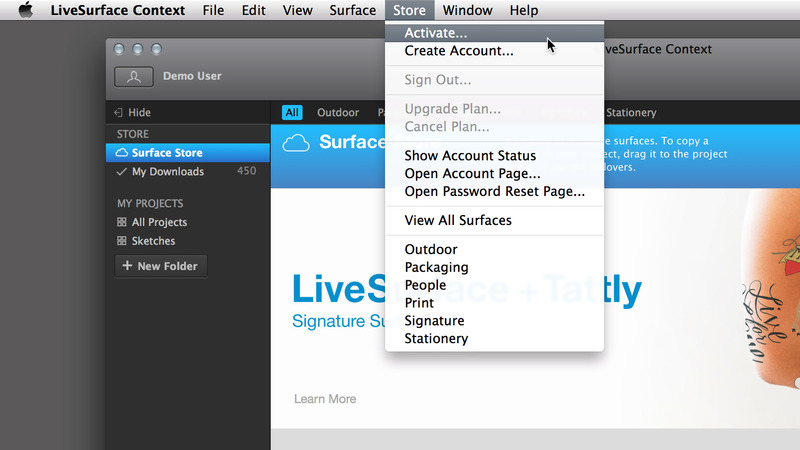 Simply select Activate from the Store menu in Context and follow the steps in the Context Setup Window to Activate. Have questions? A step-by-step walkthrough is available here. You can also purchase a subscription from your account page. Pay one flat fee to get hi-res access to hundreds of built-in hi-res surfaces in the Surface Store and use them freely for presentation use, including online portfolio use. Activating a plan unlocks access to hi-res version of the Surface Store’s surfaces. Unlocked surfaces may be exported at up to 300 dpi at letter size in TIF, JPG or PNG format. Context has been designed from the ground up to handle groups effortlessly. So, configuration for groups is built into the Context activation process; just configure the number of machines you need. Once activation completes you’ll receive codes to quickly activate and link Context on each group machine. Need to set up licensing for groups larger than 50 users? Please get in touch.